Shady Earth lovahs, we’d like to introduce you to the SPY + Surfrider Foundation “Frazier” sunnies—environmentally mindful sunglasses crafted from 100 percent biodegradable Plantate! Continuing its epic partnership with the Surfrider Foundation, SPY couldn’t be happier to announce these eco-friendly shades as the latest addition to their Recompose Collection. Boasting the brand’s color contrast enhancing Happy Lenses, which studies suggest create an uplift in mood and alertness, these sunglasses are total must-haves. To boot, they even offer complete UV protection, not to mention polarization to block 99 percent of the sun’s glare. Nose pads and temple tips that become tackier when wet to ensure a comfy fit in all conditions top things off. 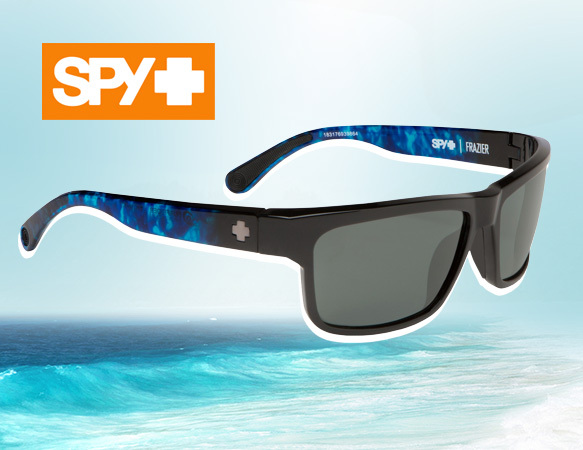 Plus, supporting the Surfrider Foundation’s Rise Above Plastics campaign and their mission to protect oceans, waves and beaches, SPY is donating $5 from each “Frazier” frame sold. It can’t get much better than that, y’all! Dig what you see? Hop on the bandwagon and get even more deets by checking out the exclusive video about these shades here.